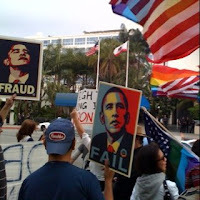 About 200 gay activists appeared outside the Beverly Hilton in Los Angeles tonight to protest President Obama's perceived inaction on LGBT rights. The president was inside attending a DNC fundraising dinner. Code Pink also protested, waving pink banners against the Iraq war. It's unknown if the president saw or heard either group.